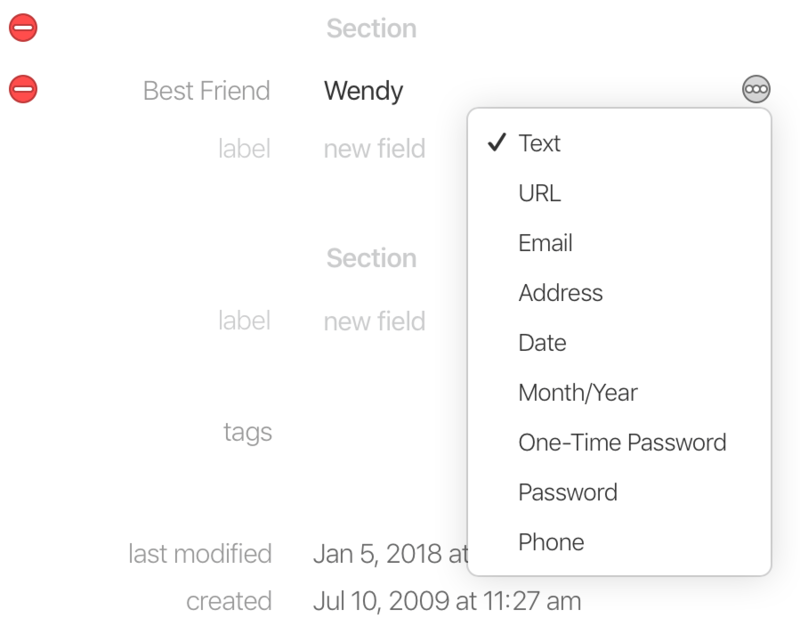 You can use custom fields to add important details to your items, like security questions, PINs, multiple contact numbers, and more. Add custom password fields to items to store concealed answers to security questions, while still making them easy to copy and paste. Add your own fields to Logins, Credit Cards, Secure Notes, or any item where you need a bit more information stored securely. Sign in to your account on 1Password.com and click a vault. Select an item and click Edit. 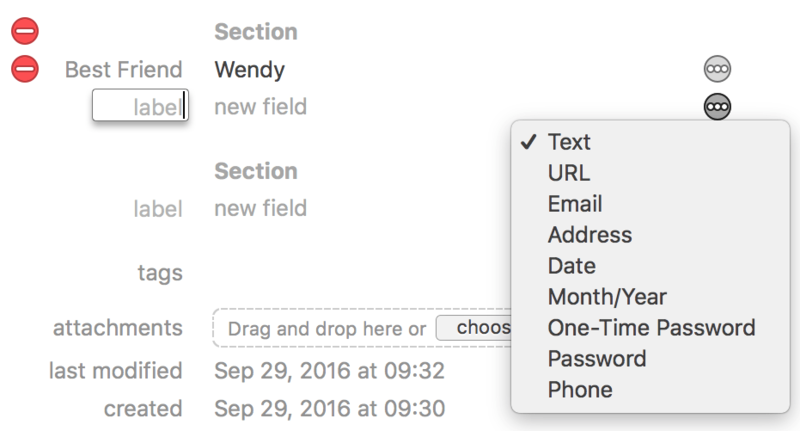 Click “label” in the section where you want to add a field, and enter a name for the field. You can also give each section a name. Click to the right of the field and choose the type of field. Click the field and enter its details. Click Save when you’re done adding fields. Click the menu button to the right of the field and choose the type of field. Select an item and tap Edit. 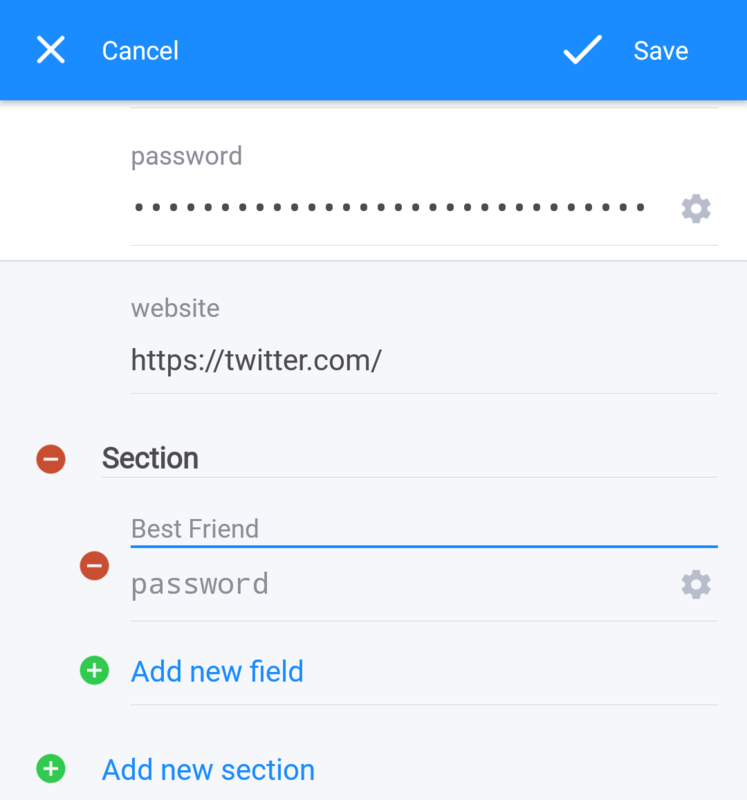 Tap “Add new field” and choose the type of field. If you don’t see “Add new field”, first tap “Add new section”. Tap the field and enter its details. You can also tap the name of the field to change it. Tap Done when you’re done adding fields. Select an item and tap . 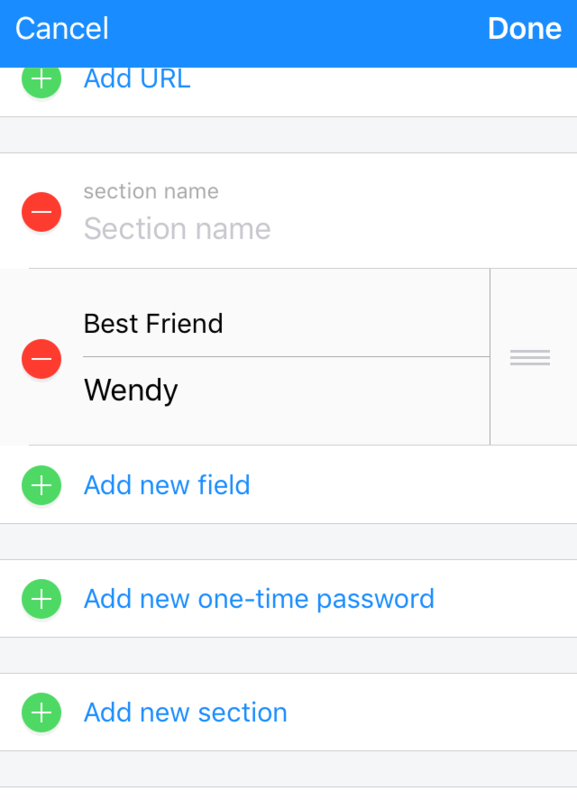 Tap “Add new section”, then tap “Add new field” and choose the type of field. Tap the field and enter its details. You can also tap the name of the field or section to change it. Tap Save when you’re done adding fields. A web address to copy or open (in your default web browser). An email address to copy or open (to send a message). A street or postal address to copy. Default is today; click to select a new date. A month and year to copy. A one-time password to copy. A password or other text to copy, reveal, or enlarge. Use the password generator or create your own. A phone number to copy or call.